Two weeks ago in the Mile High City, Peyton Manning “Omaha-ed” the Denver Broncos to a victory over the Walking Talking Touchdown Tossing Ken Doll (who is now paddleboarding in Costa Rica with Barbie) & the New England Patriots in the American Food-Ball Conference Championship Game. While up in the louder than an airplane taking off home of “The 12th Man”, Richard Sherman deflected away Colin Kaepernick’s final pass in the Seahawks’ end zone and sparked a controversy when his mouth began to celebrate before his head could catch up with it in National Food-Ball Conference Championship Game. What that all means is that it’s “Mann vs Mouth” (with credit to the New York Post) in Super Bowl XLVIII – The Denver Broncos vs The Seattle Seahawks. As a longtime Denver Broncos fan, I remember when the Seattle Seahawks played in the AFC West. I was never a fan of Jim Zorn, Steve Largent, Dave Krieg, Curt Warner or least of all Brian Bosworth. (Does he still have Bo Jackson’s footprint on his chest ?) I didn’t hate the the Seahawks like I did the Raiders, Chiefs & Chargers, they just annoyed me. I have to admit I was glad when they were moved to the NFC in the most recent expansion realignment. My disdain for the franchise had remained dormant until now. Now the Seahawks are my mortal enemy again and they are all that is standing in the way of a Denver Broncos Super Bowl victory on Sunday. So with a tip of the chef’s toque to the Monday Morning Quarterback himself, Peter King @SI_PeterKing on Twitter, let’s get to 10 Food-Ball Thunks About The Super Bowl. 1. Every year I try to come up with dishes to represent the two teams playing in the Super Bowl. In the earlier rounds of the playoffs I pick more whimsical recipes in part to spark controversy & to play on stereotypes. Come Super Bowl however, I pick recipes that I am actually going to make & eat so I try to come up with something good. When I first moved to Denver in 1982 the closest I came to Mexican food was driving past Taco Bell. The guys in my office used to take me to The Riv off of Colorado Boulevard once a week just to see me sweat. So for the Denver Broncos I am thinking of taking a Phyllo Cup and filling it with first a scoop of a Spicy Denver Omelet, then topping that with a scoop of Buffalo Burger, some Mexican 3 Cheese Mix and then tossing the whole tray under the broiler. Maybe top it with a scoop of guacamole at the end. 2. When people stereotypically think of Seattle, they think of throwing & catching salmon, starbucks & coffee, McDreamy & McSteamy and the color Black but Seattle and the state of Washington are so much more. The food scene is over the top and don’t forget about the incredible apple & cheery crops growing out in the eastern part of the state. With all that in mind and far too much time on a train in the morning to think, I have decided to roast chunks of salmon on a wire rack and to marinate & glaze them in a Cherry & Wine sauce using a chardonnay (white with fish) from a local Washington vineyard like Chateau St. Michelle. In a tribute to the “Legion of Boom”, I will have to kick it up just a notch at the end….but not too much. 3. Other Super Bowl menu items will include standards like Chicken Wings, Ribs, Deviled Eggs with Cheddar & Bacon, some sort of dip and of course, Alligator Chili. I did have someone review my Coconut Conch Chowder recipe the other day and while I don’t have any conch this year in the freezer, I did just get 10lbs of frozen crawfish tails sent to me from Louisiana. Of course I will be making a few items from the RITZ Recipe Collection and there will be other items too that I will reveal on Game Day as I make them. 4. You heard it here first. The Polar Vortex is moving out and the weather will not be a factor in this game. The only thing the two teams may have to worry about are the swirling winds in Giants Stadium but both quarterbacks played here this year (both beat the Giants handily) so that shouldn’t be much of a factor. Both kickers have guns for legs so I am not worried about them either. 5. The Seahawks & Broncos have actually already played this season. They met back in the very first week of preseason when the guys the Seahawks were going to cut beat the guys the Broncos were going to cut by a score of 40-10. It meant nothing then and it means nothing now. 7. When I first moved to Denver, John Elway still belonged to the Baltimore Colts and was playing baseball in the minor leagues for the Yankees and George Steinbrenner. I wasn’t an Elway fan at all. He went to Stanford & my Mom went to Cal. (Go Bears !) Now I believe in “Elwayism”. When I die, I believe that John Elway himself will throw my soul into heaven. 8. Yes, I will be wearing my John Elway apron when I am cook on Sunday. 9. I can’t wear my jersey on Game Day. Bad Luck. I can only wear team colors. This year the lucky shirt & shorts have been a blue & orange tee shirt from Maui and orange running shorts. I have only worn them during games and have yet to wash them. Superstition – it’s only crazy if it doesn’t work. 10. I flew last week for the first time this year. The only thing that has changed is that more people who have no clue what they are doing have been granted TSA Pre-Check status. This hasn’t made the process of flying any easier, faster or safer for frequent fliers like me. I also learned last week that if a “deadheading” pilot has to sit in a middle seat, he gets paid 50% of his hourly wage as compensation. I offered to change seats with the disgruntled pilot in the middle seat for half of his 50% but he said no. Guess sitting in the middle isn’t so bad after all. Speaking of middle seats, based on their commercial, Expedia can get you the middle seat in the last row of coach and you have to pay for your bag to be checked. Is this really an ad for orbitz or Travelocity. 11. (because I can’t count) Back in 1990 I flew on Alaska Airlines from Oakland to Seattle. My plane was called Seahawk One and I sat in a seat that was reserved for the Linebackers Coach. The flight was on time but it may have been the most miserable flight of my life. 12. (why not an even dozen) If it hadn’t been for a recent basement remodel and three bathrooms needing to be redone, I might have tried to get tickets for the Super Bowl. To be honest, I would rather my first Super Bowl be somewhere warm like New Orleans or San Diego. I have been to Giants Stadium and it doesn’t excite me. Neither does an average ticket price of $3,600 and rising with the temperature. 13. (a Baker’s Dozen is even better & 13 is our family’s lucky number) My prediction for the game – It’s the best offense against the best defense and in most cases, the best defense usually wins. However, the Seahawks haven’t faced a team with as many offensive weapons as the Broncos have. The Broncos not only have Peyton Manning calling the plays/audibles at the line of scrimmage but they also have four receivers who all scored 10 or more touchdowns and they also have two running backs who can ground & pound as well as catch the ball. The Legion of Boom is going to have their hands full trying to cover everyone. When the Seahawks have the ball, quarterback Russell Wilson has Marshawn “Beast Mode” Lynch to hand off to and a nice collection of receivers to throw to. The Broncos have to contain Wilson when he drops back to pass because he can scramble. The Broncos weakness has been their defensive secondary so if Wilson can evade the pass rush and find his receivers downfield, it could be long game for my Broncos. However I see it coming down to late in the game and Steven Hauschka kicks a long field goal to take a 26-24 lead but hold on, here comes Peyton Manning and with less than 2 minutes to go he finds Julius Thomas in the end zone for a 31-26 lead. The final Hail Mary pass from the Seahawks will get knocked down in the end zone and the Broncos will win their third Super Bowl. So give me your menu & prediction if you want and next time we can all talk about how right I was. I almost never fry food. It’s not that I don’t like fried food, everyone does. (It’s just that I am not very good at frying anything other than a couple of eggs and if you have seen any of my recent egg flipping VINE videos you may even question whether I can do that correctly. When it comes to Ribs, I am low & slow cook in the oven and then eat them with sauce all over your fingers & face kind of guy. So the concept of RITZ Country Fried Ribs both scared me a little & confused me…a lot. 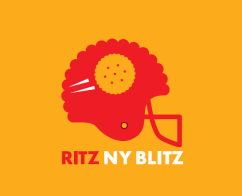 Now when RITZ decided to get involved with the Big Game coming to New York City in the first weekend of February, they partnered with various iconic restaurants in the New York area and asked them, like they did with the Allrecipes Allstars, to come up with a spin on one of their dishes. Then each of the Allrecipes Allstars was paired with one of the restaurants. I got the famous Dinosaur Bar-B-Que Restaurant (started in Syracuse, NY and now here in NYC) and their recipe for RITZ Country Fried Ribs with Zesty Buttermilk Dressing. I have to say that I was more than pleasantly surprised by my results with these ribs and not just because I didn’t mess up the frying for once. The RITZ Cracker coating was light & very flavorful. If anything, you could have actually added the Cajun seasoning to the coating instead of dusting it like the recipe calls for you to do. The coating held well to the ribs during the frying process and its coloring was rich golden brown. I think the Zesty Buttermilk Dressing could have been a little thicker & a little zestier but those are both changes that the home cook can make without having to think about it too much. I know that the next time that I make these particular ribs, I am going to add a little chipotle seasoning to the dipping sauce since I like a little more kick. So RITZ Country Fried Ribs with Zesty Buttermilk Dressing are now a part of my GAME DAY MENU repertoire and now you can make them part of yours too. You can watch the video on how to make them right here. Fried Ribs aren’t really as different as they may seem. Not many people today can picture going to or watching a football game without thinking about the food that goes with the game. The Game Day or Tailgate Spread for any game (and especially for me) is usually a well thought out menu that combines local flavors & preferences with a healthy dose of Game Day traditions. That is why when RITZ asked Allrecipes.com for help in coming up with New York inspired Game Day recipes for the biggest Game Day of the year, I jumped at the chance. I may live in New Jersey but I have worked in New York for most of my professional life and one constant has always been that when a client comes to visit from out of town, we all go eat at a steakhouse. New York has some of the finest steakhouses in the country so with that in mind, it made sense to me to see what kind of a steakhouse inspired Game Day Bite we could come up with using RITZ Crackers. It was then that I suddenly remembered an ad I used to hear on the radio every morning as I drove to the train where the owner of a very famous steakhouse said that you could always find him in the kitchen with his spoon in the creamed spinach. 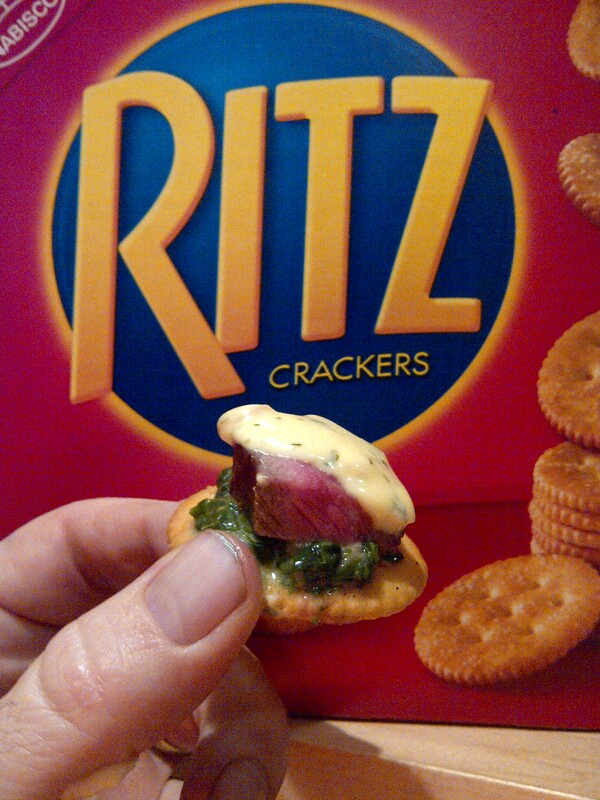 It was in that instant that the concept for RITZ Steakhouse Bites was born, a RITZ Cracker with a spoonful of creamed spinach on it, topped by a slice of steak & a drizzle of Béarnaise Sauce. It’s a classic New York steakhouse taste in just a single bite. Now when it comes to cooking, I have always been a fairly straightforward kind of cook who does well with the basics. To put it into football terminology, I am a “3 yards & a cloud of dust” kind of chef so putting a little razzle dazzle into my kitchen playbook could have been somewhat daunting but it wasn’t and if I can make them, so can you. First I’ll give you recipe and then I’ll give you a few tips on how to make it so you’ll be dancing in the end zone with your guests on Game Day. Heat olive oil in sauté pan over medium heat. Add spinach and cover for 1 minute to steam. Uncover and stir spinach until it is wilted. Drain spinach, dry between paper towels, and chop. Melt butter in the same pan over medium heat. Add shallots and sauté for a minute. Add heavy cream and nutmeg; stir to combine. Add chopped spinach and combine thoroughly. Remove from heat when spinach is creamy. Add salt and pepper. Set aside. Melt 1 tablespoon butter in a separate sauté pan; add shallots and white wine vinegar. Cook until all liquid has evaporated, about a minute. Remove from the pan; set aside to cool. Add egg yolk and lemon juice to blender; slowly blend in half cup of melted butter until mixture is smooth and creamy. Pour into shallots mixture. Stir in chopped fresh tarragon. Now for some of those tips I promised. Creamed Spinach is really quite easy and the baby spinach leaves will wilt quickly. Do pat dry the spinach after you have let it drain for a little while in order to make sure you don’t have too much excess moisture. If you don’t have fresh spinach, frozen will work but it really needs to drain. You can always add more butter or cream and keep a lemon handy to brighten it a little with a quick squeeze rather than adding more salt. Trust me, Béarnaise Sauce is easier to make than it is to spell. The hardest part is separating the eggs. I have found that despite the small batch being made, that it is much better to use a blender than it is to use a small food processor. The one time I used a food processor, the sauce came out a little thin. Tenderloin or Filet Mignon are the true New York Steakhouse steaks that you want to use for these Game Day Bites on the biggest of Game Days but slices of any cut of steak will actually do if you make sure the slices are thin enough to chew easily. And in my next blog we are going to do just that. 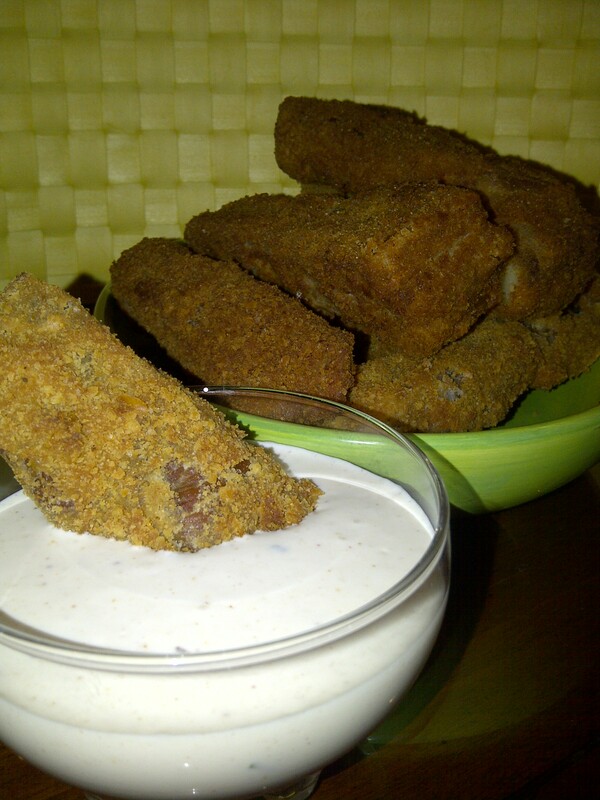 Dinosaur Bar-B-Que has come up with one of their own RITZ inspired Game Day Bites recipe (RITZ Country Fried Ribs with Zesty Buttermilk Ranch Dressing) and I am going to make them because BBQ was made for Football and Football was made for BBQ.